I had some time to kill at the Ferry Building on Tuesday and while poking around at Sur La Table I found a Texas-shaped cookie cutter. What are the odds? It was in there with the cowboy boots and cactus. 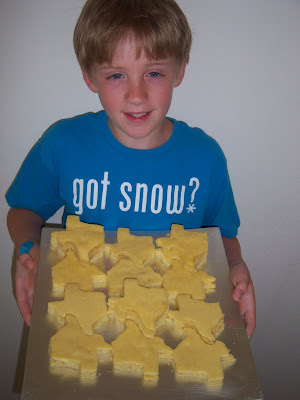 We'd been thinking about making chili for him to bring to class to go with his written and oral reports for Open House - but a Texas-shaped treat would be even better. I was thinking cookies, but the fellow at Sur La Table suggested cornbread - a great idea and much easier than rolling & cutting cookies. I think the baking goddesses sent me that cutter, because when I got home I discovered that Open House was the NEXT DAY not the NEXT WEEK as I'd thought. 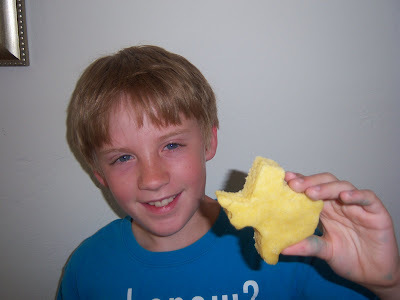 Luckily, I had the ingredients for a batch of cornbread on hand and my newly-acquired cutter ready to go.